It can sometimes be a challenge to think of interesting things to do with minced meat – there’s only so many times you can make spag bol or chilli. Keema matar is a lovely, deeply flavoured North Indian dry curry dish that’s traditionally served with Indian breads – pooris and parathas – but goes just as nicely with a simple bit of rice. It takes under an hour to make and uses just one pan – perfect for a midweek dinner. Don’t be put off by the list of ingredients – I bet you have half the stuff in your cupboard anyway and if you don’t then buying them will be a good investment for future Indian-food-making. First do your prep – chop all the things that need chopping, and bash up all the spices. If you don’t have a pestle and mortar, put the spices in a plastic bag and bash it with a heavy implement. Most satisfactory. Heat the oil in a wide frying pan over a medium flame. When hot, add the onions and cook for 5-7 minutes or so until they’re starting to turn brown. Don’t worry about under or over cooking them too much, this dish is quite forgiving. Add the garlic and fry for one more minute, giving it a bit of a shake and stir so it doesn’t burn. Now add the minced meat, ginger, chillis, ground coriander seeds, cumin and cayenne. Give it a good stir – it is my (entirely unproved) belief that if you can get the spices in contact with the meat before it’s browned, they cook and meld together better. It’s like they stick together, becoming better friends for having gone through the frying process as one. Fry for about 5 minutes or so on a fairly high heat, breaking up any lumps as you go. Don’t stir it too much, it’s nice when it catches on the pan a little and adds a bit of texture. When it’s nice and brown, add 150ml water. Bring to the boil, then turn down the heat and leave it to simmer for 30 minutes. Check it every now and then and use the power of your brain to assess whether it’s too dry and needs more water or it’s fine. Taste often – chef’s perks! Now add the peas, coriander, salt, garem masala, lemon juice and 75ml water. 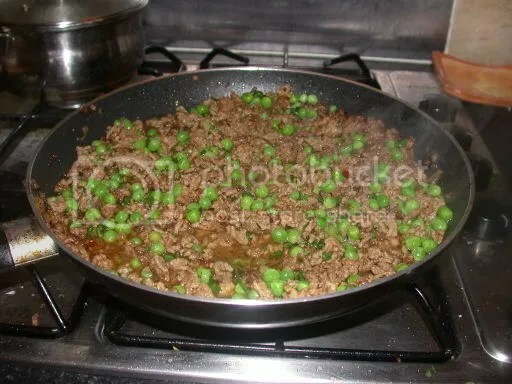 Mix it all in and bring it back to a simmer – cook until the peas are done (about 5 minutes). Taste it. Add more salt if you feel it needs it. Serve with bread/rice/dhal. Congratulate yourself on how brilliant it tastes. I often stare at packets of mince, bereft of inspiration. But no more. I shall try this soon. I want to try and make bobotie too. I had to use ground ginger and I didn’t have any cayenne but it was REALLY nice!! This site is now in my favourites and I am going to try some more recipes. I’m pleased it went so well for you! hi, drawn to look at recipe as have been making a version of this for many years (found recipe in dodgy cookbook years back, now a very stained recipe). just to add a suggestion…recipe i use is almost identical but suggests adding diced potatoes at the 30min simmering stage and a swirl of natural yoghurt at the end. the potatoes give it a nice added texture and bulk (great for leftovers!!!) and the creamy yog can be a nice counterpoint to the spices. Love the way you write up your recipes!!! Funny you should say about the potatoes, I’ve jsut added them independently and then read your posting! It worked really well. Really nice if you double the spice quantity and include spuds at 30min simmer stage, then carrot and cauliflower towards the end of the simmer (before the peas). Just makes it a healthier more balanced meal. I’m going to have to make this for my husband very soon as we both adore Indian food and he has always said he knew there was a curry made with mince and i never believed him. I’m going to try this without peas and not sure what instead..! Possibly tomatoes and some yogurt. Mmm. Have done the ‘normal’ version before and it definitely is good and very extendable for unexpected guests. lovely dish i tried and it worked well. btw the search function doesnt work on ur blog? i cant seem to be able to type anything inthe search box. Glad the kheema worked well for you. I’m not sure why you can’t use the search function, it’s working fine for me. I’ll look into it. Thanks for your recipe! As with many traditional recipes, there are many variations on kheema. The above is only my version and I accept that there are many other recipes out there with differing ingredients. It is just what I have been looking for, I am glad that it is made without tomatoes. I have tried it, it was best…………. Absolutely agree, I use this method in most dishes to release the fragrance of the herbs and spice just before adding the meat. MMMMMMMMMMMMMMMM!!!!! DAT LAMB CURRY IS PURE DEAD BRILLIANT!!! EROTICENTRIC AND OVER THE TOP STIMULATING. I NEED IT EVERY SECOND NITE JUST TO MAKE MY EVENING GO MMMMMMMMMMMMMMMMMMM!!! This was a most enjoyable recipe. Get it made!! Mujhe keema matar itna pasand hai yaar! aap ko ye samaj bhi nahi aana. I tried this substituting each ingredient for a pint of Guinness. Outstanding! the gravy was dripping from my fingers as i scooped up mouthfuls with chipati. Thank you! Very happy with the end result, easy and a very tasty dish, will try it again adding potatoes and other vegetables, definately a recipe that i would keep. Why does everyone always want to mess with a classic ? Add potatoes and its no longer kheema matar, which when made properly can’t be improved.